THERE IS A FEAR that we are losing our young – to values and lifestyles foreign to us. They live in a new world, both exciting and dangerous. 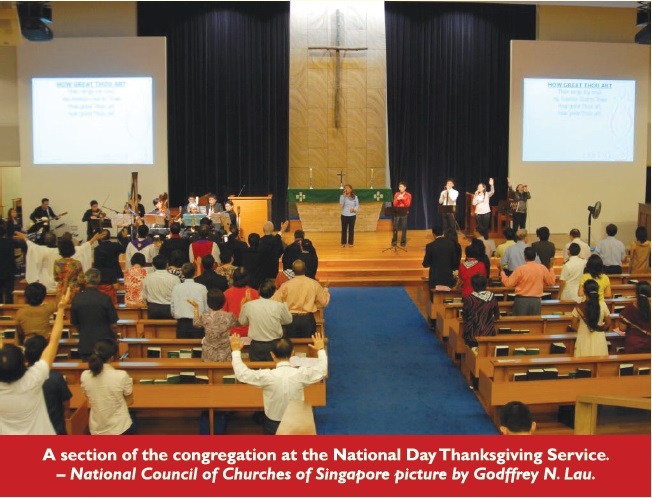 Stating this in his sermon “ rough All Generations” at this year’s National Day anksgiving Service at St Andrew’s Cathedral’s New Sanctuary on Aug 12, Bishop Dr Robert Solomon added that young Singaporeans needed guidance and “we must pass on our faith to the next generation”. 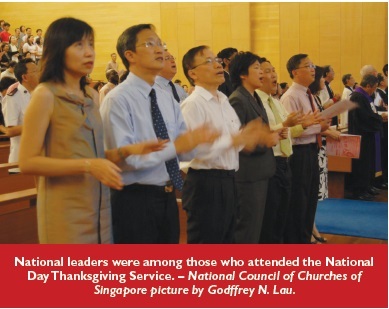 Speaking in his capacity as President of the National Council of Churches of Singapore, which organised the service, he said that our worldview and hopes must be rooted in the eternal sovereign God who watches over all of us. His years redemptively frame our short, limited and uncertain days. His years give dignity to our days. A church is as strong as its compassion for the least, the last and the lost. The same applies to the nation. ere are people like that in our midst. God cares for them. The Bishop disclosed that in a survey conducted by the National Youth Council in 2000, “To lead a lifestyle that I desire” was the top choice of 39 per cent of youth. is compares to the 44 per cent who chose “To live as I like” in a 1996 study. “To get rich” was the next top choice for 16 per cent of Singapore youth in 2000. As the majority of youth are single, they have more freedom to do what they want. The rise in these more pragmatic life goals did not match any significant shift towards civic consciousness, said the Bishop. The least mentioned life-goal is “To improve society and the world” (8 per cent) in the 1996 study. Similarly, “To contribute to the growth of our society” tied with “To help the needy” as the top choice of only 2 per cent of the youth in 2000. Referring to Psalm 102: 11-18 and 25-28, the text of his sermon, he said there are two things we learn about God here. Firstly He is sovereign. He is in control. He has not lost control over nature or history. Nothing happens without His design or permission. This is a comforting and reassuring truth. We are not the debris of a mindless history, but beings who are loved and shaped by God. We are not simply blown about in a storm like fragile leaves, but behind the wind is the breath of God. This gives us reassurance that the present is meaningful, that our circumstances, whether as individuals, families, churches, and as a nation, have some meaning connected with the sovereign God. 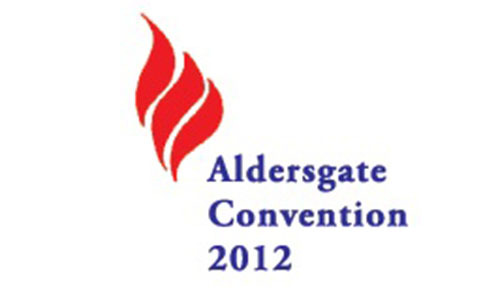 We can therefore put our hearts and souls into the present, making it better, hoping prayerfully for the grace of God. The second thing we discover about God is that He is eternal. He will outlast everything. He will have the last word on everything. When all is gone, He remains. is truth is summarised in the phrase “Your years.” “Your years go on through all generations” (v 24). God will outlast our generation and would be present in every generation. More than that, God will outlast all generations and nations. “But you remain the same and your years will never end.” (v 27). This is grace at work, said the Bishop, and this is what has been entrusted to the church to share. At 7.50 pm, the greetings and chats in the New Sanctuary and the cacophony outside gave way to the sweet sounds of Cathedral Bells ringing out “Ämazing Grace”, signalling the start of the anksgiving Service. 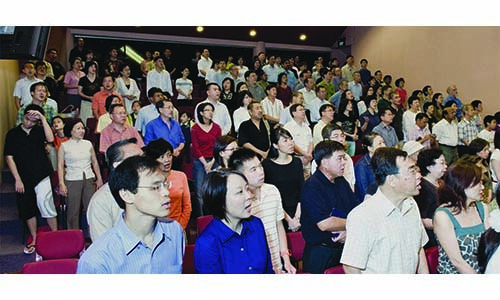 Among those present were Mrs Lim Hwee Hua, Minister in the Prime Minister’s Oﬃce, and her husband; Mr Gan Kim Yong, Minister for Manpower, and his wife; Associate Professor Ho Peng Kee, Senior Minister of State for Law and Home Aﬀairs; and Mr Lim Biow Chuan, an MP for Marine Parade GRC, and Mrs Lim. Following the prelude, the singing of several hymns and choruses, a choral anthem, and a rousing rendition of “From Many Shores” – a song for the nation – heads of various denominations led in praying for the nation. First, Bishop Terry Kee of the Lutheran Church in Singapore, led in the prayers for the President, Ministers, Members of Parliament and the Civil Service. He was followed by the Rev Dr Steven Gan, Vice-Moderator of the Presbyterian Church in Singapore, who prayed for Peace, Harmony and Security. 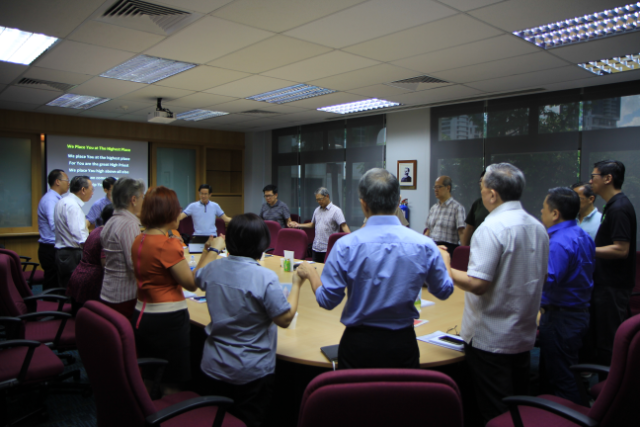 Then, the Rev Robert Lum, Assistant General Superintendent of the Assemblies of God, Singapore, prayed for the Church, its Ministry and Outreach. The Thanksgiving Service ended with the closing hymn, “Shine, Jesus, Shine!”, after which Anglican Archbishop John Chew pronounced the benediction. The worshippers and guests then gathered outside the sanctuary, facing the amphitheatre, for a tea fellowship and to reflect on the service and how Singapore has been so richly blessed these past 45 years, a point emphasised in several prayers and during the service. 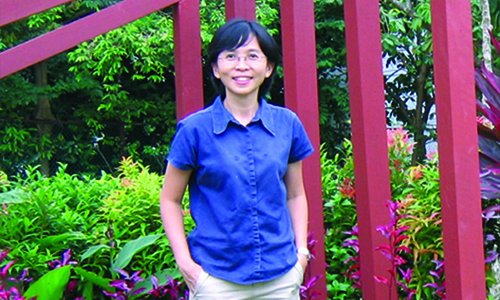 Peter Teo is the Editor of Methodist Message.